September | 2010 | WHATEVER! One of the most notible modern atheists, or as he likes to describe himself an “anti-theist”, looks like one of the world’s most well known theologians. An important article for Obama’s naive admirers (that may also be of interest to his detractors). Dinesh D’Souza writes an article in the September 27, 2010 print issue of Forbes Magazine titled “How Obama Thinks“. This may be THE most important article I have ever read about Barack Hussein Obama. It provides brilliant insight into what motivates this man and it goes a long way toward explaining the policies that he has implemented and others he is determined to implement. What strikes me as really interesting (but not a part of the article) is that while old Soviets used to regard Western sympathizers as “useful idiots,” it has now become clear to me that Obama probably regards his fellow democrats as the “useful idiots” that are necessary to achieve his ends, described in the article. And my hunch is, these Obama sympathizers are probably not smart enough to know that he is using them. Consequently, this article is probably more important for Obama’s admirers to read, than his detractors. And until he can be voted out of office in 2012, an increasingly likely event, an awakening by these democrats may be our country’s best hope for the next couple of years, unless the republicans can deliver in November 2010 and put the brakes on some of Obama’s deconstructionist plans. My take on burning ‘holy’ books. Let’s cut to the chase…Terry Jones’ plans to burn korans, leave him wide open to being regarded as an idiot, at least insofar as being a pastor of the gospel and minister of the grace of God in Jesus Christ. If he really wanted to affect the Muslim world for the sake of conversion from their Islamic religion, he would evangelize rather than antagonize. While the irenic discrediting of the Muslim ‘holy’ book would be an ultimate outcome, the figurative (or perhaps even literal) burning of korans should be left to the converts, not the converter. Like Phelps, Jones seems to have a congregation who sits under his leadership more by virtue of cult-like programming or even blood relationships, rather than by free, independent philosophical alignment with his teaching. At the risk of seeming cavalier about it, so-called ‘holy’ books, are not in and of themselves ‘holy.’ That is to say, the paper and ink, and the materials used to bind them into a single book, are not ‘holy.’ Instead, it is the teaching that is contained within them that has spiritual weight and significance. Case in point. I have several Bibles. Each one is published with a different English translation. I own them in physical book form. Most if not all of these same Bibles are also available on my computer, both in terms of data that can reside on the computer’s hard drive, or in portable media like a CD or flash drive. Most if not all of these are also available via the internet. Most if not all are also available for access via so-called Smart Phones or other “readers” like a Kindle, or an iPad. All of this is to say that the content of these Bibles is what is ‘holy’, not the method or means by which that content is delivered. To argue the other side is to suggest that mere paper, or your PC, Mac, Blackberry, or iPhone are in and of themselves “HOLY” simply because they contain, or can access information which IS ‘holy’. Related to number 4 above, to elevate a book (in its physical, material and tangible form even if it is a Bible or a koran) to such a level that its loss or destruction incites a violent response, would seem not to just border upon, but actually cross the line to being properly identified as idolatry. The whole koran burning exercise that will supposedly take place on Saturday is, at its most fundamental level, pointless. Unless what is being burned is the very last, and only remaining koran, I am hardly impressed that the fiery destruction of a bunch of copies of it in Gainesville, Florida is going to have any particular impact on the remaining availability of korans, or the continued teaching of the material contained therein. Boiled down to its essence, all that is being burned is a bunch of paper and the materials used to bind it together in one book. The world supply of korans is not going to be materially affected, nor will the continued practice of that faith. Apologists for the Islamic faith simply can’t have it both ways. On one hand they claim that Islam is a “peaceful religion”, and yet they warn that the burning of their ‘holy’ book by some kook in Florida will incite violence around the world to the point where soldiers and other non-Islamic westerners are in imminent danger. The distance between these two extremes is untenable and calls into question the truthfulness of the original claim about the peace-loving nature of Islam. If in fact the burning of korans incites violence, it ultimately will speak volumes MORE about the true nature of Islam, and the character of its adherents, than it will about a nut in Florida, whose real credibilityextends no further than the 50 cult members he controls and whose real influence should not extend beyond that same limit. I’ll tell you, from the dancing dog, to the guy looking at the magazine centerfold, to the hula hooping, it just doesn’t get any better than this! 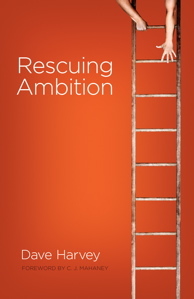 Rescuing Ambition, by Dave Harvey, is a winner. It is the second book I have read by Harvey, and while I would say it was not as compelling as his first, When Sinners Say ‘I Do’, it nonetheless was well worth the time I invested in it. The essential premise of the book is that human beings, were created to be ambitious. In the original created order, our ambition was intended to pursue those things that would bring glory to the creator. However, in the fall, ambition turned its sights inward, resulting in our seeking self-glory. Today, most of us probably think of ‘ambition’, as the attribute, or character quality of those who are driven to succeed in,…you name it…, scholastic endeavors, business, or sports. This is an ambition to be admired. But sometimes, when it is taken to extremes, we regard ‘ambition’ as that attribute or character quality that motivates people to claw, grab, back-stab, neglect, and abandon, all in the interest of advancing an agenda, with little to no regard for the collateral damage left in one’s wake. Ambition is innate. And ambition’s ultimate end is to produce glory. And as Harvey points out, we were designed to love glory and to seek after it. However, we must seek after a certain type of glory. And the type of glory we should be seeking is that which comes from God as opposed to man-made glory. In the 11 chapters in the book Harvey does a great job of spelling out ambition’s origins, it’s corruption and the steps we need to think about to rescue it. With the same wit and humor that was evident in his first book, Harvey has produced an easy-to-read guide to turning us from selfish ambition to the ambition originally conceived by God. You are currently browsing the WHATEVER! blog archives for September, 2010.